Man, I hate marathon cleaning. You know, when you suddenly look around and realize that your house is totally trashed and you have people coming over? Yeah. It used to happen to me a few times a year. Often it was the kids’ birthday parties that caused it. Or 30 times. Either way. You know how it goes: you invited people over a month ago and kept telling yourself you’d just clean next weekend…And before you know it, you have exactly 27 hours before your guests will arrive. And at least two of those guests are guaranteed to judge the shot out of you (at least you think so). But hold up: I have good news for you, my darling. You can be lazy AND have a house that stays relatively clean – one that stays “drop in clean” (clean enough that you could have a friend or neighbor drop by unannounced and feel comfortable inviting them in. 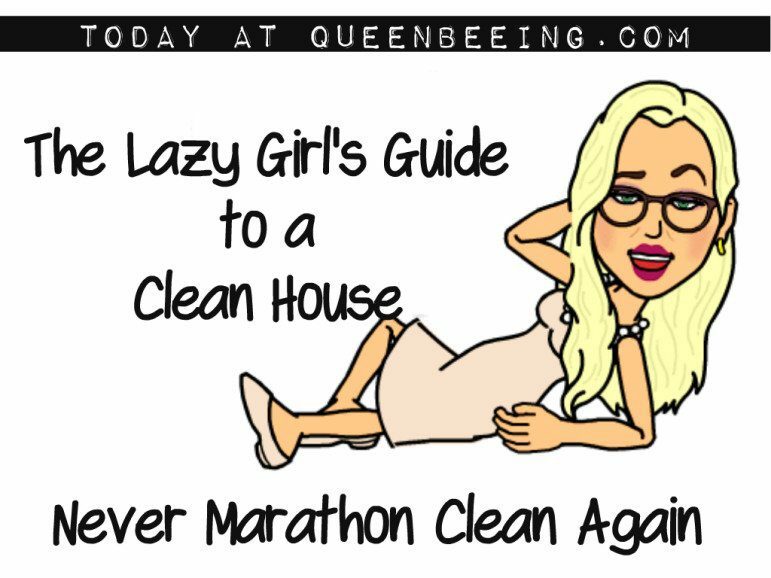 Even better, this kind of method can ensure that you never do the exhausting overnight cleaning marathon that inevitably causes you to be miserable during the actual event. So here it is, my lazy sisters, the only guide you’ll ever need to keep your house clean without too much stress or effort. Get microfiber towels. They clean almost anything without streaks including mirrors and glass. No Windex needed. Wipe down the shower or tub with a microfiber cloth after each use. Same goes for the bathroom and kitchen sink. Vacuum the middles. Like weekly. Most of the time, you can get by with vacuuming weekly or biweekly, and you can get away with not moving the furniture for a month or more if you’re careful. Beware of knick knacks. I’m just saying: it’s a lot easier to wipe off a table with a vase and a couple of candles than one covered with Precious Moments collection-type stuff. Put those in a glass case if you must display them – they will never get dusty. Only eat in the kitchen and dining areas of your home. This might feel a little unnatural at first but imagine the stains you could avoid on your couch and carpet. Plus it’ll do you some good with your eating habits. Don’t smoke or burn incense in the house. Anything that makes your house dusty or dirty or stinky should be avoided if you’re trying to keep your house clean the lazy girl way. That leads me to my next point, actually. Don’t make a mess in the first place. Clean up after yourself as you go. make a rule for yourself that you don’t leave messes behind. Fact is that it can get overworked if you let it go too long. Look, it is 100 percent easier to keep a house clean than to clean a dirty house. So get it clean once and stay on top of it. Then you’ll never have to do those 27-hour-pre-party cleaning marathons again. Disclaimer: Before you try these or any tips I offer, please note that they work for me, but they may not work for you. I can’t be responsible for any frustration, so be careful. Oven cleaner takes soap scum out of an old tub like it was nothing. Make sure the bathroom is vented and keep the kids away. Spray down the scummy spots, wait 10 minutes and wipe clean with a wash cloth or sponge. Use old shampoo to clean the toilet. It’s made to handle organic material and it works in the old loo. Same for the bathroom sink. Toothpaste will shine silver. This includes jewelry and silverware. A Swiffer WetJet mop is awesome, but I recently switched to a reusable Libman mop that lets me use my own floor cleaner and has washable pads. It makes cleaning up a spill super convenient.